Lewandowsky: those believing in global warming are gullible. Based on the ethics application, Lewandowsky’s known views on skeptics and comments he made about “the pause” it appears this project was set up with the expectation that it would show that skeptics changed their views depending what they thought the graph showed. It was probably expected that skeptics would demonstrate a bias by changing their estimation of future trend when informed the graph showed global temperature and it might have been expected that many would say it was cooling. 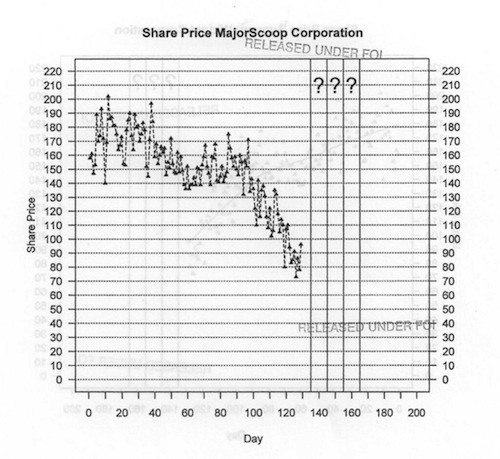 To test this idea, the groups were randomly split into those told the graph was the share price and another told it was global temperature. They were also asked their views on climate and Lewandowsky then compared those within each group to see how their beliefs on climate was related to their average prediction of the future trends. It turns out the survey showed the complete opposite effect to that we believe was expected. Skeptics in the group told it was temperature and those told it was share prices had almost the same prediction of the future trend. So irrespective of whether it was shares or global temperature skeptics estimate of future trends were very similar. In contrast the expected trend given by global warming believers differed dramatically between those who were led to believe the graph showed share prices and those led to believe it was global temperature. This is a very significant finding. It appears to show that those who believe in warming are very suggestible and that skeptics base their views very largely on the evidence and not what they are told the evidence shows. But the final paper avoided this conclusion by focussing on another point saying that: “even skeptics predict it will warm”. This focus only appeared after the results were available. To put it bluntly, the paper strongly suggests that people who believe in global warming are more gullible and skeptics are very resistant to false suggestions. The project seeks to explore people’s understanding of statistical trends in time series data. If we are monitoring a stock price, what do we think will happen to it in the future? Participants will be shown simple graphs of time series (samples enclosed) and will make predictions about the future trends. Subjects will be shown a number of statistical graphs (3 or 4 at most) that contain time series data. Subjects will be asked to extrapolate the visible trend into the future by indicating their guess of the next most likely values (see enclosed sample). Some of the trends will be upward, some downward, and most will be presented as fictitious stock prices. The actual data will either be generated randomly or will be the world’s temperature (climate) data collected by NASA (NASA GISS data set). For some subjects, the climate data will be identified as such whereas for other subjects (chosen at random) they will be presented as stock prices. The aim is very clear. The project aimed to understand how participants background affected how they viewed statistical trends. This was going to be tested by asking them to predict the future trend of a plot after one group was told it was stock market data and other that it was global temperature. Then this would be tested to determine whether participants views on issues like climate change affected their perception of the likely future trend. This study,… suggests that presentation of climate data can counteract contrarian claims about global warming having stopped. Notably, although extrapolations overall differed little between presentation formats, people’s perceptions were related to their attitudes only when the data were identified as temperatures; however, even for those few individuals in that condition who explicitly rejected AGW, extrapolations were still (just) significantly positive. Like most people would, when I read this I understood this to be a statement about “contrarians” to the effect that contrarians were more likely to change their view depending whether the data was said to be climate or stock markets. This shows that whilst “skeptics” tended to interpret a temperature graph as having a slightly higher gradient (3.75) than that of shares (3), those who believed in global warming dramatically changed their view of the graph because when everyone was included there was a dramatic change between when told it was temperature (5.51) and when share trend (3.66). As skeptics would have reduced this figure, it is fairly safe to say that whereas skeptics showed almost no change in the predicted trend irrespective of what they were told the data was, believers must have doubled their predicted future trend depending only on what they were told the graph portrayed. But this obvious conclusion that those believing in global warming are very subjective and change their interpretation to fit their beliefs in sharp contrast to skeptics who tended to base their views only on the data and not what they were told the data showed, was not only omitted from the paper, but instead it was replaced with a conclusion very strongly suggesting the opposite. As such not only does this paper show that members of the public who believe in global warming change their perception of the global temperature graph to fit what they believe it shows, but it is also strong evidence that at least some academics are so strongly influenced by their beliefs regarding global warming that (to put the best possible interpretation on their actions) they are “blinded” to obvious conclusion that do not fit their world-view. 5 Responses to Lewandowsky: those believing in global warming are gullible. “so what could have led to such a dramatic change in focus.” Simple answer, Lew’s a monumental idiot (and I cleaned that up). A real sceptic would have refused to complete the survey because the questions were stupid. It turns out that even part time sceptics aren’t as gullible as he believes them to be. The first thing for him to learn is that sceptics don’t think scientists tend to argue with the concept that emissions affect climate change. The questions are what and how much. Why is that so hard for people like Lew to grasp… oh I already answered that “Lew’s a monumental idiot”. Torrect own convictions is certainly no spontaneous and no favourite human pastime. Yes, it may be necessart and it may hurt. Popper’s ideas were not at all popular among all fuzzy-heads and believers of absurditgies, but they are fully correct and will slowly conquer and imbue the intellectual world, the hard sciences and the philosophy in the tradition of the Vienna Circle and the Austrian School of Economics with its roots in the British empirism of David Ricardo and Adam Smith, but their development in Austria.Hungary. (By the way: The latter one’s seminal ‘The Wealth of Nations’ (1776)has recently got its sagacious follow-up in Richard Lynn & Tatu Vanhanen’s ‘IQ and the Wealth of Nations’ (2008). This shows that these 2 powerful lines/schools of scientific thought with their origin in Scotland and Vienna still run in good congruence with each other. In Richard (VC, physics) & Ludwig von Mises (ASE, economist) or the families of Carl Menger & Karl Menger, Reichenbach, Tarsky, Gödel, Wittgenstein and many others we can study that it were fatal political events and cruel violence in Europe’s war and Holocaust events that abolished the Law, the Freedom and the Human Rights of the people and drove/transferred brains, heritage and legacies of these Austrians (Popper as their greatest and latest mentor – he had survived in New Zealnd) from the Continental Europe over the Sea back to once Great Britain and to the distant Americas. The IPCC*s continuous work deteriorated the situation by its anti-Popper-and anti-empiricism course with a silly and obfuscating pseudo-“scientometric” search for majorities and a fake consensus. Nothing presents more eye-opening evidence for the dominance of mediocrity than a deep diving in the Swedish research of the 19th and early 20th Century, when all decisive CO2, data, tree ring and temperatur curve disinformation was planted, bred and spread throughout the country. After the input of Arrhenius and Bolin, the spawn for the ‘unprecedented’ AGW threat accumulated progressively, but worst of all: irreversibly into a self-sufficient and by a totally clueless UN bureaucracy financed, rapidly growing cuckoo child, the IPCC. After Bolin, the proven scientific crook Michael Mann took over the lead in the IPCC. When he was unmasked as curve manipulator and author of worthless junk science (his comment: “That doesn’t matter!”) he was replaced by Robert Watson and when this initially commited scientist noted the ‘warming bias’ and cheating tendencies in the IPCC he was urgently replaced by the Indian railroad engeneer Pachauri (who by now is a multi-millionaire whose organization also has received a Nobel Prize, shared with Al Gore). Yes, Swedish, geologists, physicists (Mörner, Siegbahn, Gerholm, Stilbs, Goldberg, Karlén, Finland’s Boris Winterhalter), solarists (nearly all of them, from Lundstedt in Lund to Lundin in Umeå) and oceanographers, even Norwegian and Danish Polar scientists (Humlum, Johannessen, Lindberg, Segalstedt) and physicists , Swiss glacierologists, German speleologists, oustanding Czech scientists such as Ján Veizer, Lubos Motl and their president Waclav Klaus, the Polish CO2-scientist Jaworowski, the Israeli astrofysicist Nir Shaviv, and the leading Russian astronomer, space physicist and sun-observer Abdussamatov – as his Norwegian colleage Pål Brekke, the Danes Friis-Christensen, Lassen, Svensmark, Marsh, the American solarists Baliunas, Parker, Soon, Yaskell – and another 800-1000 truly ‘top’ scientists (which I am listing, describing and citing in a comprehensive climate book) – they include more than 70 nobel prize Winners, while the IPCC ‘s AGW front and its believers brag with the two fake ‘Nobel laureates’ Bert Bolin and Pachauri, who are not – embarrassingly (as the Nobel Foundation felt urge to correct – such a simple fact, repeatedly!). Of course, the IPCC tries desperately to repair their rapidly crumbling air castle of a fancied scientific ‘consensus’. The short, but decisively eye-opening book by Lawrence Solomon ‘The Deniers’ (239 pp) suffices to understand what is to come. What I would give for a grook of him (Dan/Norw/Swed: gruk) about the whole AGW affär. In fact, he has made one that comes very near. I will put it in my climate book. PS: You shoudn’t publish this on your blog, I feel, but I would be grateful for an answer to my initial question. My professional background is medicin, neurofysiology, virology, epidemiology and the issue of successful collective errors. Therefore, I have also written a 672 pp book about the brains of men & women. but in German, as I in Sweden would have been tarred and feathered on Stockholm’s Sergel’s torg. Prof. Lewandowsky has priors on deriving hypotheses that are contradicted by the evidence. He posited that failure to share his beliefs on climate was due to “conspiracist ideation”. The rejection of climate science was part of a general distrust of science, and belief in conspiracy theories. His first survey to test this was on climate alarmist blogs. It showed that the vast majority of respondents has no truck with conspiracy theories. The conclusion that sceptics had a propensity for “conspiracist ideation” was based on two scam responses and the low proportion of sceptics. The second survey was a cross-section of the American public. This has a better balance and a much higher proportion of belief in conspiracy theories. This showed that strong beliefs about conspiracy theories (accept or reject) predicted strong acceptance of well-established scientific propositions (such as smoking causes lung cancer) and strong opinions (both for and against) on climate science. The strongest believers in climate science were (by a small margin) those with strong beliefs in climate science. Lewandowsky also posited that climate scepticism was due to “free market ideation”. The data suggests something different. Within the US population there is a weak but significant link. There was also an a link with the small number of sceptics who answered the questionnaire posted on alarmist blogs. But most significant was that the vast numbers of those who frequent alarmists are both strongly pro “climate science” and hold very green-left political views. More importantly, the evidence would strongly suggest something I had previously rejected. Climate “science” is seen as a means of imposing extreme left beliefs, rather than the scientific revelations the only way to avoid future catastrophe is to suspend democracy in favour of enlightened experts.